Researchers from IAN and the Simons Foundations Autism Research Initiative will discuss the results of a follow-up study of families who participated in the Simons Simplex Collection (SSC), a major research project that has yielded new information about autism. Seventeen (4 percent) families reported having another child diagnosed with autism spectrum disorder (ASD) in the intervening years. IAN researchers looked at the relationship of family income and population density on school services for children with autism.2 They surveyed parents of 1,774 children with ASD who lived in communities of different population sizes. Children in rural areas had more school suspensions, and were less likely to attend specialized schools (public, nonpublic or private) than children in cities, suburbs and small-medium metropolitan areas. They also were less likely to be in private, general schools, according to IAN's Briella L. Baer. Household income did not appear to affect attendance in a public school, which more than two-thirds attended regardless of income. However, there were differences in other school placements by income. For example, children whose families earned more than $135,000 a year were more likely to attend specialized private/nonpublic schools than children whose families earned $45,000 or less. Children in rural areas, and children from families who earned $45,000 a year or less, were more likely to be homeschooled than other children with ASD. Check back tomorrow and Saturday for more conference reports from IAN. 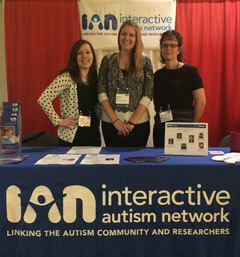 Photo of Jaimie Toroney, MHS; Briella Baer, MHS; and J. Kiely Law, MD, MPH, at IMFAR. Brooks E, Toroney JW, Feliciano P, et al. Simons Simplex Collection at the Interactive Autism Network: An online follow-up study. Poster at the International Meeting for Autism Research, May 11, 2017. Baer BL, Marvin AR, Lipkin PH, Law JK. Impact of household income and urbanicity on school services. Poster at the International Meeting for Autism Research, May 11, 2017. Marvin AR, Law JK, Marvin D, Lipkin PH. Age-based patterns of parent-reported medical and behavioral problems in children and adolescents with ASD. Poster at the International Meeting for Autism Research, May 11, 2017.